Somebody please enlighten me on what she's holding, I know she's always with it. Is that what gives her mind reading abilities? Perhaps she's resentful of her power? It's her Third Eye. And, yes, it's what give her this mind-reading power. She's resentful, or she's playing "to be or not to be" satori-style. 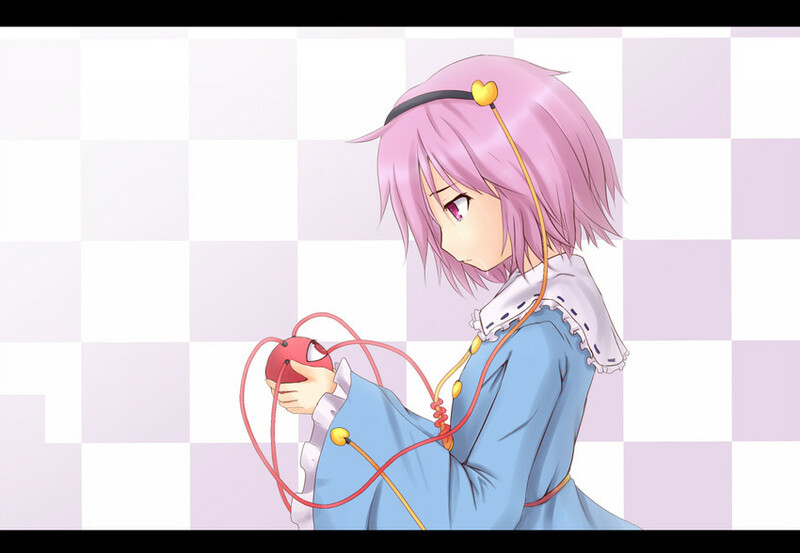 She is somewhat discontent, since being a Satori means that most people don't like her. Koishi resented being a Satori a lot more and took some steps to eliminate that problem, at the expense of losing a part of her own mind in the process. Almost looks as if Satori is thinking of following her sister's lead.